What does the Supreme Court’s health-care ruling mean for me? is from The Washington Post. What the health care ruling means to you is from CNN. High court supports health insurance mandate is from The Associated Press. Supreme Court, 5-4, upholds most of health care overhaul is a graphic from the Orange County Register. With the health care reform vote, and its anticipated passage, occurring today, I thought it might be useful to create a related “The Best…” list. You might also be interested in The Best Resources For Learning About the Health Care Debate. Many students will have heard something about it, and I’m just trying to figure it out all myself. It’s unfortunate that it will not provide health insurance to the undocumented. That omission doesn’t make any sense fiscally (people will just go to expensive emergency rooms) or for public health (having adults and children with untreated medical conditions that are contagious) — not to mention morally. However, I hope that if immigration reform happens, perhaps people who are “legalized” will become eligible. I’m assuming resources that are more accessible will be coming-out, so I’ll be adding to this list. * Sites that explain provisions of the law in a relatively accessible way. * Sites that compare health care costs around the world. These can help students understand one reason why the law was passed. * Sites that review the history of health care reform efforts in the United States. As usual, I’ve only included resources that I think might be accessible to English Language Learners. The Basics comes from the Kaiser Family Foundation. The PBS News Hour has a relatively clear review of the House, Senate and Reconciliation bills. You probably want to point students towards the Reconciliation column. 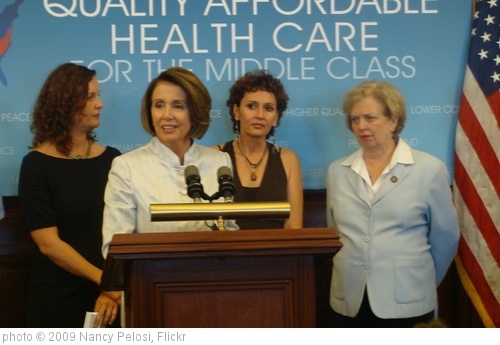 How Does Health Reform Work? is an infographic from The Center For American Progress. FACTBOX-US healthcare bill would provide immediate benefits is from Reuters. How the Health Care Overhaul Could Affect You is from The New York Times. What the health-care bill means for you is an interactive from The Washington Post. The Wall Street Journal has an interactive showing the key parts of the bill and when they take effect. How the health care bill could affect you is an interactive from CNN. “Timeline Of The New Health Care Bill” is a nice infographic from Visual Economics. How Different Types of People Will Be Affected by the Health Care Overhaul is another interactive from The New York Times. ‘The Reality of Reform’: Understanding the Health Care Law comes from The New York Times Learning Network. GOOD Magazine has held a contest for infographics that explain the new health care reform law. They’ve just posted all the submissions. The federal government has added a fairly accessible interactive questionnaire to its health care site to help people understand various health care coverage options. Here’s another infographic reviewing the changes coming to health care in the U.S. over the next few years as a result of the new health care reform bill. The Associated Press has an extensive interactive on the bill’s implications. The Cost of Health Care: How Much Waste is an interactive infographic. Health Care Around The World is from the BBC. World Health is an infographic from GOOD Magazine. Compare International Medical Bills comes from National Public Radio. Here’s a comparison from National Geographic. How the world compares on health care comes from Market Watch. Health Care Spending: U.S. vs. Abroad is a very accessible infographic from Kiplinger. “U.S. Healthcare Spending vs The Globe” is another infographic comparing spending on health in the U.S. with other parts of the world. I wouldn’t say its the best one I’ve seen, but it does have some different information. Overall, the winner in this year’s contest was the Netherlands. Interestingly, perhaps, it’s a nation that doesn’t have a government-run system, but instead achieves universal coverage with an individual insurance mandate, much like the one recently passed by the U.S. Congress. The Dutch were first in access, first in equity, and second in quality of care. The U.S., by contrast, was last in every category except quality, where it was second to last, squeaking in ahead of Canada. At $7,290 in annual spending per person in 2007, the U.S. also dwarfed second-place Canada at $3,895 and third-place Netherlands at $3,837. Health Care Timeline is from MSNBC. A History of Overhauling Health Care is from The New York Times. Health care and the government comes from The Associated Press. Health Care Reform In America is from The Wall Street Journal. Health Care Timeline is from CNN. Where Poor and Uninsured Americans Live is an interactive from The New York Times. Fantastic catalog of amazing resources! Keep up the good work!